But do consumers really want such a feature? The Akyumen Hawk is a 5.5-inch Android handset that packs a low-profile projector into the upper half of the phone. The 35-lumen projector has enough power to display an image over a distance of about a meter in a normally lit room and at up to 100 inches in a more dimly lit room. 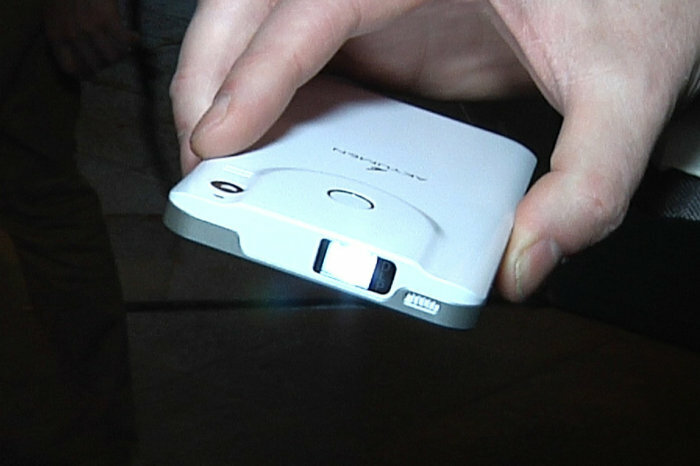 Akyumen says the secret to its phone is a proprietary projector that stays cool even after hours of use. And indeed, during a demonstration in Barcelona on Sunday, the phone was only slightly warm despite the projector being used for at least 20 minutes. But keeping the phone cool and extending battery life assume they are the reasons that projector phones haven't been popular in the past. At first glance, it might seem like an attractive feature, but the projectors add some weight, bulk and cost to the handset. On a prototype of the Hawk smartphone, the area around the projector protruded by a few millimeters while the weight was roughly that of a modern smartphone. The internal battery will provide 2.5 hours of projection time and an add-on power pack in a base station brings another 5 hours of use. The Akyumen Hawk smartphone with built-in projector is demonstrated in Barcelona on February 26, 2017. Perhaps where consumers will feel the difference is in the price. The phone will cost US$750 when it becomes available in the third quarter of 2017, although pre-orders are currently being accepted on the Akyumen website for shipping on March 31 for between $799 and $999. That prices the phone in line with top-of-the-line handsets from leading vendors such as Apple and Samsung. Projector phones have been tried before. Samsung launched its Beam in Singapore in 2010 and relaunched it two years later. Both times, it didn't make much of an impact on the market. There was also a projector inside Sharp's Robohon, a robot-smartphone mash-up that went on sale in Japan last year, and other companies have produced tiny add-on projectors or projector cases for phones. But none have been successful. Perhaps because, while it's a neat idea, there just isn't the constant need to project your phone screen to make it worth the extra bulk and cost. Or maybe Akyumen is correct and heat and short battery life have been stopping the technology from growing. Akyumen's plans are big. In addition to the phone and a companion tablet, the company is also funding the launch of a new online video service that will include movies and original content and will come bundled on the phone. The company says it plans to sell the device in all major worldwide markets.